Filmjolk is a traditional Swedish cultured milk that contains a blend of 15 live cultures and probiotics. Rokeby Farms are an Australian brand owned by The Made Group that also includes Cocobella and Impressed Juices. Research by the Gut Foundation Australia has shown that over 50 per cent of Australians complain of gut related health issues every year. Advanced Sports Dietitian and Nutrition Health expert Simone Austin said many people are unaware that symptoms such as bloating and lethargy can be linked to gut health. “The consumption of naturally probiotic-rich foods such as Filmjolk could help restore your inner health and wellbeing,” Austin said. Co-founder and Director of The Made Group Luke Marget says Australia’s love for fresh dairy such as milk and yoghurt makes Filmjolk the perfect breakfast food. “We recommend enjoying our Filmjolk as part of your daily breakfast routine, poured over cereal or fresh fruit or simply drinking on its own,” Marget said. Filmjolk contains Bifidobacterium which is a powerful probiotic proven to support gut health by increasing digestive regularity according to Marget. Probiotics are live micro-organisms such as bacteria and yeasts which in adequate amounts may have health benefits. Probiotics differ from prebiotics which are non-digestible food ingredients that can increase the activity of some ‘good’ bacteria. Prebiotics occur naturally in bananas, onions, wheat and garlic. In Australian, probiotic products are considered either functional foods and regulated by Food Standards Australia New Zealand or complementary medicine and regulated by the Therapeutic Goods Administration. 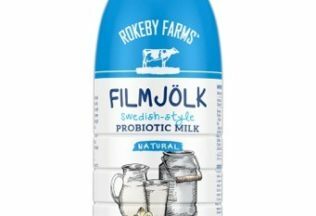 Rokeby Farms Filmjolk is available in Natural and Blueberry at Woolworths supermarkets and independent retailers in Australia for $5 per 750ml bottle. Buderim Ginger is entering the alcohol market with two ginger flavoured drinks. Doritos Burn corn chips are returning to Australian supermarkets.